You may have noticed we changed our blog name the other day. We have been maintaining two blogs, InfoBrief and Competitive Edge. Now, we have decided to merge the two blogs under the banner of InfoBrief, with the new InfoBrief following in the same space that Competitive Edge was using. Another change you may have noticed is that, using the widget in the right-hand column, you can now share the content of this blog on Facebook, Twitter, and many other social media sites, as well as via e-mail. And, you can print from InfoBrief as well in this widget. Any other tools you’d like to see on InfoBrief? Post a comment to let us know! 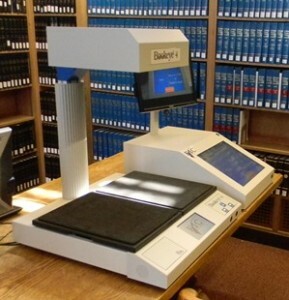 We have a new scanner for library users installed in the Reading Room. The Bookeye 4 has a book cradle, which means you no longer have to place the book face down on the scanner, scan the page, pick up your book, turn the book, and place the book down again. All you have to do is turn the page and scan! It will scan materials up to 24.4 by 16.9 inches (620 x 430 mm) in resolutions up to 600 by 400 dpi. You can choose to create JPEG, TIFF, or PDF files, and choose whether to e-mail the file or save it to your flash drive. And, of course, your scans can be black and white or color. You can learn more about the scanner model here. For help using the scanner, check out the video tutorial available on the scanner’s screen, or ask at the Circulation Desk or Reference Desk. The Cornell Law Sc hool Library has purchased two additional HeinOnline databases, Congress & the Courts and the History of International Law Collection, for use by the Cornell University community. Congress & the Courts is a collection focusing on the organization, structure, and legislative history of the federal courts and judiciary. It includes William H. Manz’s Congress and the Courts: A Legislative History 1787-2010, covering the U.S. Congress’s approaches since 1789 to the composition and structure of Article III Courts. It also includes Federal Judicial Center publications and scholarly articles about the federal courts. The History of International Law Collection includes more than 700 titles going back to 1690. These titles include classic books by authors such as Hugo Grotius and William Douglas, serials such as Studies in Transnational Legal Policy and Judicial Settlement of International Disputes, scholarly articles, and bibliographies. You can explore the contents of these databases here. 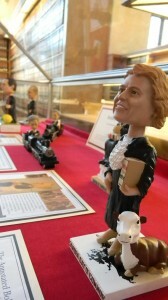 Don’t forget - our SCOTUS bobbleheads are still on display! A few months ago we told you about our collection of U.S. Supreme Court bobblehead dolls on display in the Reading Room. They’ll be on view for another couple of weeks, so come on in and check them out.